Yes, Kobe changed his number in 2007 to #24, but that doesn’t change how great he was when he donned the #8 jersey. He is perhaps the greatest NBA player to ever wear the number, accumulating multiple championships and All-Star Game appearances during that time. There is a better-than-good chance that the Los Angeles Lakers will retire both #8 and #24 when Kobe retires. 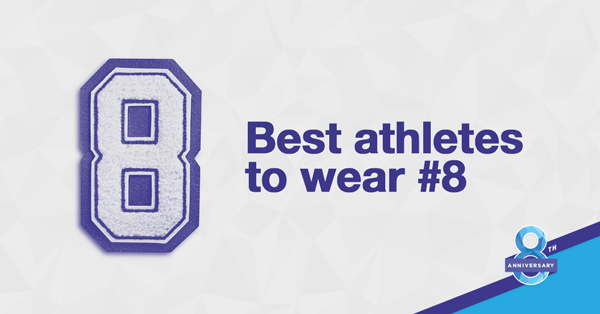 If that is the case, his #8 would be the first player with that number retired in NBA history. Following in Joe Montana’s footsteps would be a tough task for any player, but Steve Young didn’t just do it well, he was a Hall of Fame player in his own right. Playing from 1987-1999 with the San Francisco 49ers, Young won a Super Bowl in 1995 and made seven Pro Bowl appearances over that span. He was elected to the Pro Football Hall of Fame in 2005 and is one of just two players in NFL history with the #8 retired by a team. Tim is a content developer and email marketing manager here at TicketNetwork. Graduating from the University of Connecticut in 2006 with a degree in Journalism, he enjoys watching his favorite TV shows including Parks & Rec, Brooklyn Nine Nine and Always Sunny in Philadelphia, among others (definitely not the Big Bang Theory - a truly awful show). He is also a die-hard sports fan, which includes rooting for the New England Patriots (sorry Jordan), Boston Red Sox (sorry Jordan), Boston Celtics (sorry Jordan), and UConn Huskies.